Excerpt from DE L’ALLEMAGNE – “Germany” by Madame Germaine de Staél-Holstein (published 1810, the 1813 John Murray translation), Vol. 1, 349-358. Goethe stands unrivaled in the art of composing elegies, ballads, stanzas, &c.; his detached pieces have a very different merit from those of Voltaire. The French poet has transfused in his verse the spirit of the most brilliant society; the German, by a few slight touches, awakens in the soul profound and contemplative impressions. Goethe is to the highest degree natural in this species of composition; and not only so when he speaks from his own impressions, but even when he transports himself to new climates, customs, and situations, his poetry easily assimilates itself with foreign countries; he seizes, with a talent perfectly unique, all that pleases in the national songs of each nation; he becomes , when he chooses it, a Greek, an Indian, or a Morlachian. We have often mentioned that melancholy and meditation which characterises the poets of the north: Goethe, like all other men of genius, unites in himself most astonishing contrast; we find in his works many traces of character peculiar to the inhabitants of the south; they are more awakened to the pleasures of existence, and have at once a more lively and tranquil enjoyment of nature than those of the north; their minds have not less depth, but their genius has more vivacity; we find in it a certain sort of naivete, which awakens at once the remembrance of ancient simplicity with that of the middle ages: it is not the naivete of innocence , but that of strength. We perceive in Goethe’s poetical compositions, that he disdains the crowd of obstacles, criticisms, and observations, which may be opposed to him. He follows his imagination wherever it leads him, and a certain predominant pride frees him from the scruples of self-love. Goethe is in poetry an absolute master of nature, and most admirable when he does not finish his pictures; for all his sketches contain the germ of a fine fiction, but his finished fictions do not always equally convey the idea of a good sketch. In his elegies composed at Rome, we must not look for descriptions of Italy; Goethe scarcely does whatever is expected from him, and when there is anything pompous in an idea it displeases him: he wishes to produce effect by an untrodden path hitherto unknown both to himself and to the reader. His elegies describe the effect of Italy on his whole existence, that delirium of happiness resulting from the influence of a serene and beautiful sky. He relates his pleasures, even of the most common kind, in the manner of Propertius; and from time to time some fine recollections of that city which was once the mistress of the world give an impulse to the imagination, the more lively because it was not prepared for it. He relates, that he once met in the Campania of Rome a young woman suckling her child, and seated on the remains of an ancient column; he wished to question her on the subject of the ruins with which her hut was surrounded: but she was ignorant of everything concerning them, wholly devoted to the affections which filled her soul; she loved, and to her the present moment was the whole of existence. We read in a Greek author, that a young girl, skillful in the art of making nosegays of flowers, entered into a contest with her lover, Pausias, who knew how to paint them. Goethe has composed a charming idyl on that subject. The author of that idyl is also the author of Werther. Goethe has run through all the shades and gradations of love, from the sentiment which confers grace and tenderness, to that despair which harrows up the soul but exalts genius. After having made himself a Greek in Pausias, Goethe conducts us to Asia in a most charming ballad, called the Bayadere. An Indian diety (Mahadoch) clothes himself in a mortal form, in order to judge of the pleasures and pains of men from his own experience. He travels through Asia, observes both the great and the lower classes of people; and as one evening, on leaving a town, he was walking on the banks of the Ganges, he is stopped by a Bayadere, who persuades him to rest himself in her habitation. There is so much poetry, colours so truly oriental in his manner of painting the dances of this Bayadere, the perfumes and flowers with which she is surrounded, that we cannot, from our own manners, judge of a picture so perfectly foreign to them. The Indian diety inspires this erring female with true love, and touched with that return towards virtue which sincere affection should always inspire, he resolves to purify the soul of the Bayadere by the trials of misfortune. When she awakes, she finds her lover dead by her side; the priests of Brama carry off the lifeless body to consume it on the funeral pile; the Bayadere endeavors to threw herself on it with him she loves, but is repulsed by the priests, because, not being his wife, she has no right to die with him. After having felt all the anguish of love and of shame, she throws herself on the pile in spite of the Bramins. The god receives her in his arms; he darts through the flames, and carries the object of his tenderness, now rendered worthy of his choice, with him to heaven. Zelter, an original musician, has set this romance to an air by turns voluptuous and solemn, which suits the words extremely well. Where we hear it, we think ourselves in India, surrounded with all its wonder; and let it not be said that a ballad is too short a poem to produce such an effect. The first notes of an air, the first verse of a poem, transports the imagination to any distant age or country; but if a few words are thus powerful, a few words can also destroy the enchantment. Magicians formerly could perform or prevent prodigies by the help of a few magical words. It is the same with the poet: he may call up the past, or make the present appear again, according as the expressions he makes use of are, or are not, conformable to the time or country which is the subject of his verse, according as he observes or neglects local coloring, and those little circumstances so ingeniously inverted, which, both in fiction and reality, exercise the mind in the endeavor to discover truth where it is not specifically pointed out to us. Another ballad of Goethe’s produces a delightful effect by the most simple means: it is “the Fisherman.” A poor man, on a summer’s evening, seats himself on the bank of a river, and, as he throws in his line, contemplates the clear and limpid tide which gently flows and bathes his naked feet. The nymph of the stream invites him to plunge himself into it; she describes to him the delightful freshness of the water during the heat of the summer, the pleasure which the sun takes in cooling itself at night in the sea, the calmness of the moon when its rays repose and sleep on the bosom of the stream: at length the fisherman attracted, seduced, drawn on, advances near the nymph, and forever disappears. The story on which this ballad is founded is trifling; but what is delightful in it is, the art of making us feel the mysterious power which may proceed from the phenomena of nature. It is said there are persons who discover springs hidden under the earth by the nervous agitation which they cause in them: in German poetry we often think we discover that miraculous sympathy between man and the elements. The German poet comprehends nature not only as a poet, but as a brother; and we might almost say that the bonds of family union connect him with the air, the water, flowers, trees, in short, all the primary beauties of the creation. There is no one who has not felt the undefinable attraction which we experience when looking on the waves of the sea, whether from the charm of their freshness, or from the ascendancy which an uniform and perpetual motion insensibly acquires over our transient and perishable existence. This ballad of Goethe’s admirably expresses the increasing pleasure we derive from contemplating the pure waters of a flowing stream: the measure of the rhythm and harmony is made to imitate the motion of the waves, and produces an analogous effect on the imagination. The soul of nature discovers itself to us in every place and under a thousand different forms. The fruitful country and the unpeopled desert, the sea as well as the stars, are all subjected to the same laws, and the man contains within himself sensation and occult powers, which correspond with the day, with the night, and with the storm: it is this secret alliance with our being with the wonders of the universe which gives to poetry its true grandeur. The poet knows how to restore the union between the natural and the moral world: his imagination forms a connecting tie between the one and the other. There is much gaiety in several of Goethe’s pieces: but we seldom find in them that sort of pleasantry to which we have been accustomed: he is sooner struck by the imagery of nature than by ridiculous circumstances; with a singular instinct, he points out the originality of animals, always new yet never varying. 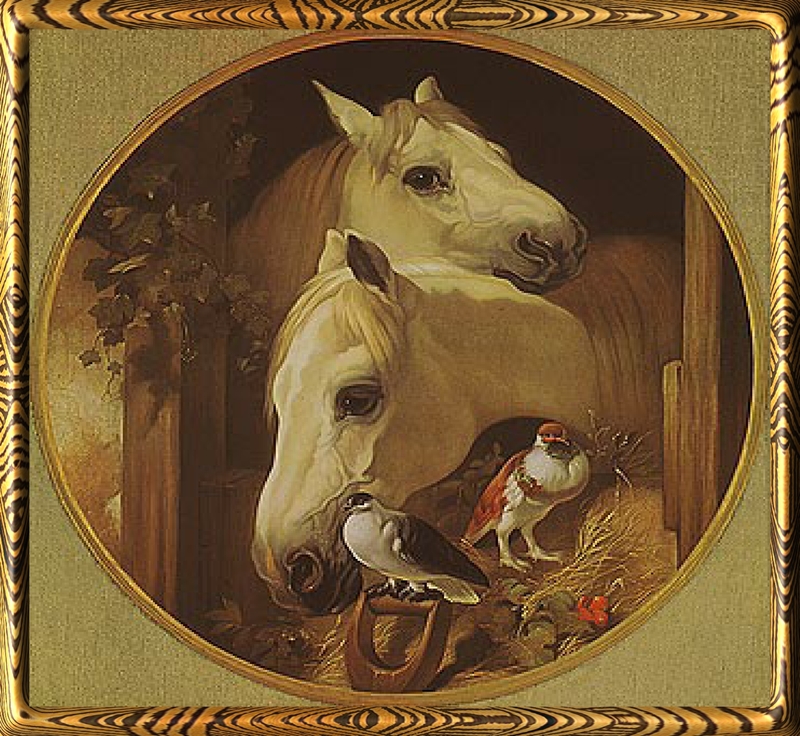 “The Menagerie of Lily,” and “The Wedding Song in the Old Castle,” describe aminals, not like men, in La Fontaine’s manner, but like fantastic creatures, the sports of Nature. 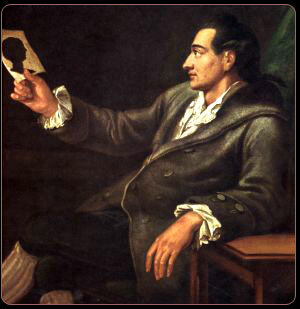 Goethe also finds in the marvelous a source of pleasantry, the more gratifying because we discover in it no serious aim. A song entitled “The Pupil of the Sorcerer” also deserves to be mentioned. The pupil of a sorcerer having heard his master mutter some magical words, by the help of which he gets a broomstick to tend on him, recollects those words, and commands the broomstick to go and fetch him water from the river, to wash his house. The broomstick sets off and returns, brings one bucket, then another, and then another, and so on without ceasing. The pupil wants to stop it, but he has forgot the words necessary to that purpose: the broomstick, faithful to its office, still goes to the river and still draws up the water, which is thrown on the house at the risk of inundating it. The pupil, in his fury, takes an ax and cuts the broomstick in two; the two parts of the stick then become two servants instead of one, and go for water which they throw into the apartments as if in emulation of each other, with more zeal than ever. In vain the pupil scolds these stupid sticks; they continue their business without ceasing, and the house would have been lost, had not the master arrived in time to assist his pupil, at the same time laughing heartily at his ridiculous presumption. An awkward imitation of the great secrets of art is very well depicted in this little scene.